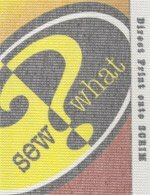 Sharkstooth Scrim - Sew What? Inc. This is a direct print substrate. Sharkstooth Scrim – A scrim is a commonly used piece of stage curtain magic. Due to the scrim fabric’s unique capabilities, when lit correctly from the front, a scrim appears opaque. When the front light is turned off, however, and objects behind the scrim are lit, the fabric appears transparent. Sharkstooth scrim fabric, with its rectangular weave, is dense enough to provide a digital printing surface and still become transparent when back-lighted, therefore making it an extremely versatile piece of stage scenery. Pros: Combining digital textile printing technology with a traditional theatrical effect keeps your production on the cutting edge. Cons: Cotton Sharkstooth Scrim is very delicate and does not take well to use and abuse. As with a traditional unpainted scrim – the transparency “effect” will only work under correctly manipulated lighting conditions.